Update: A Microsoft spokesperson has told TechRadar that the company has "nothing to announce at this time". However, Polygon reports that Microsoft confirmed the white Xbox One will be available with Sunset Overdrive "later this year". The game launches on October 28, so there's a good chance that we'll see the lighter-toned console become available. The pale Xbox One may get its day in the sun(set) this October. A French retailer has listed - and then removed - a white Xbox One console and Sunset Overdrive bundle, priced at €399, sparking suspicions that a more official announcement may be nigh. 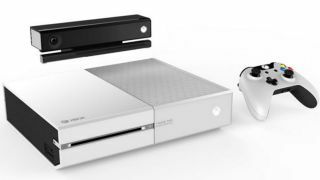 The white Xbox One was initially an exclusive for Microsoft employees (though a couple did pop up on eBay) but French site Micromania has listed the console for an October 28 release. Microsoft's not confirmed anything yet, so hold tight. But what would you know, it's Gamescom in a few days. Wonderful timing.